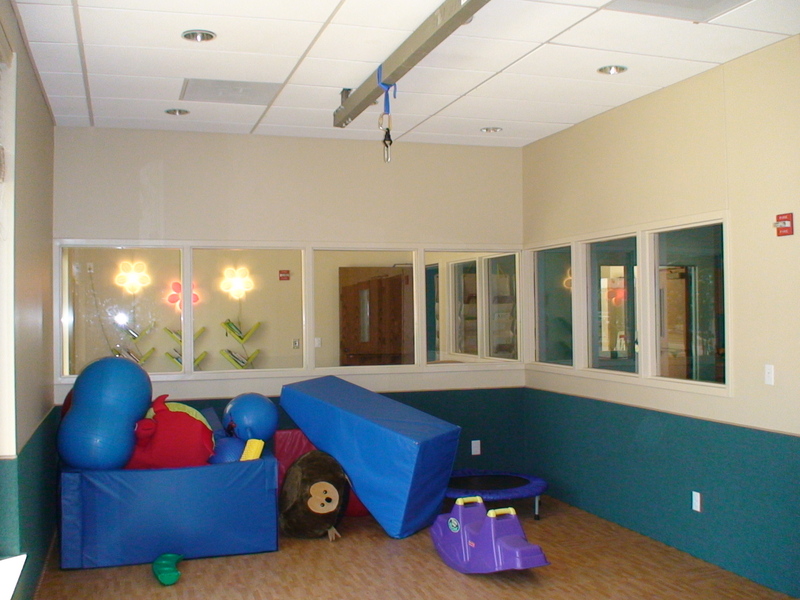 The sensory room houses a number of toys to engage a child in gross motor play. The “pit” is filled with large blocks and vinyl covered soft foam pieces such as seen here or here. A small mini-trampoline is on hand for children who need a to work out some energy. Very often a child demonstrating “sensory seeking” behavior can be satisfied by a quick jump on the trampoline, returning to a calmer state after meeting his or her “sensory diet”. Meaghan explained that the toys and tools selected for this room serve the purpose of creating a fun experience for the participating students and not necessarily to serve as an extension of therapy. 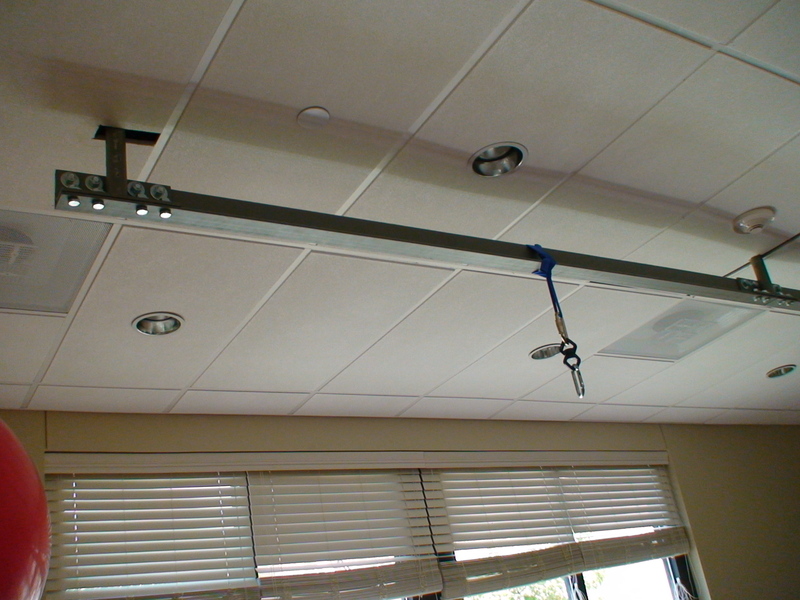 While the room and its toys are utilized during every programming environment, the swings are especially helpful during FunZone Respite events. 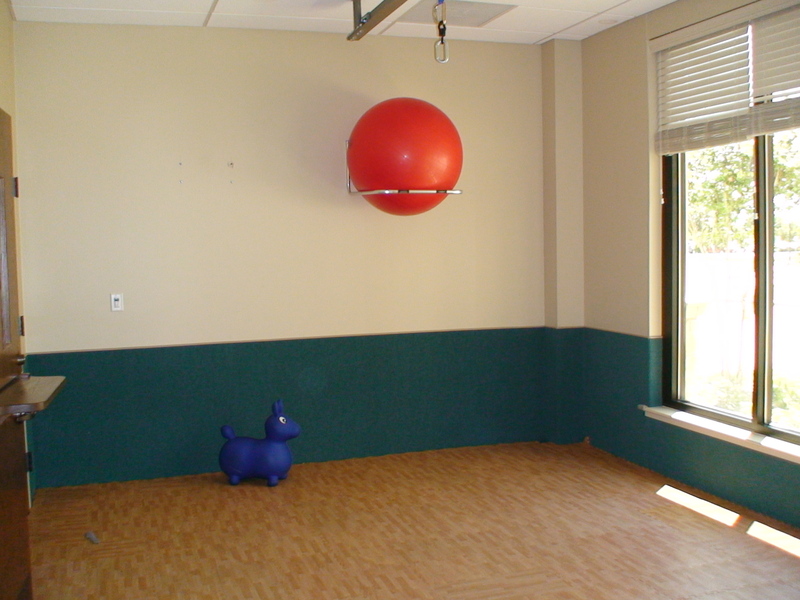 This picture also shows a red exercise ball (also referred to as a yoga ball). I love how the exercise ball is stored out of reach to students unless a caregiver or buddy working one-on-one with the child (such as shown here). These balls come in many sizes and sometimes with sensory textures as well. Target, Wal-Mart and most sporting good stores carry various sizes and colors of these balls. Meaghan noted that it is good to have several sizes on hand because of the varying sizes of the participating children. Stonebriar uses these balls often, sometimes bringing one into a hallway or a large group for a child to sit on during an activity. And a child can bounce on the ball, helping with the same issues noted above with the Rody Toy or below with the trampoline. Note: Therapy balls are wonderful sensory tools but can be dangerous if a child is playing on them without supervision (and the child accidentally rolls forward on their head). 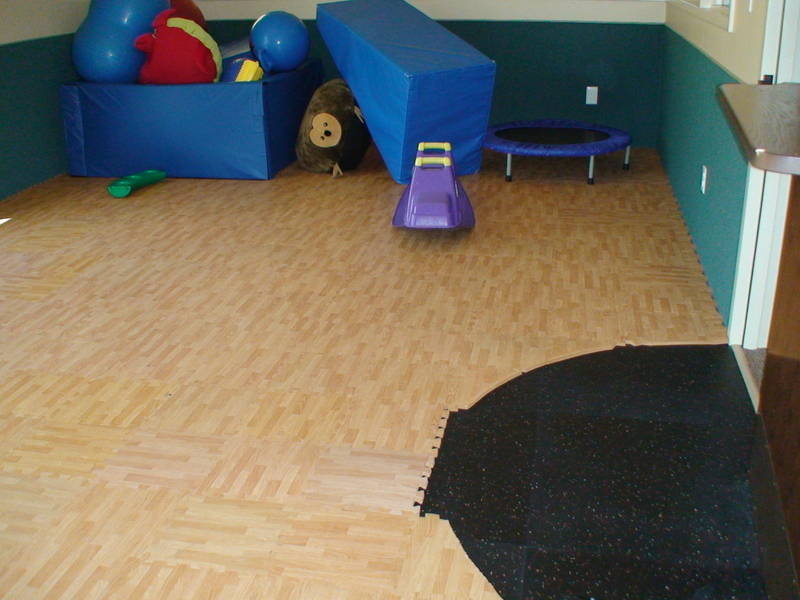 These two pictures show the flooring inside the sensory room. 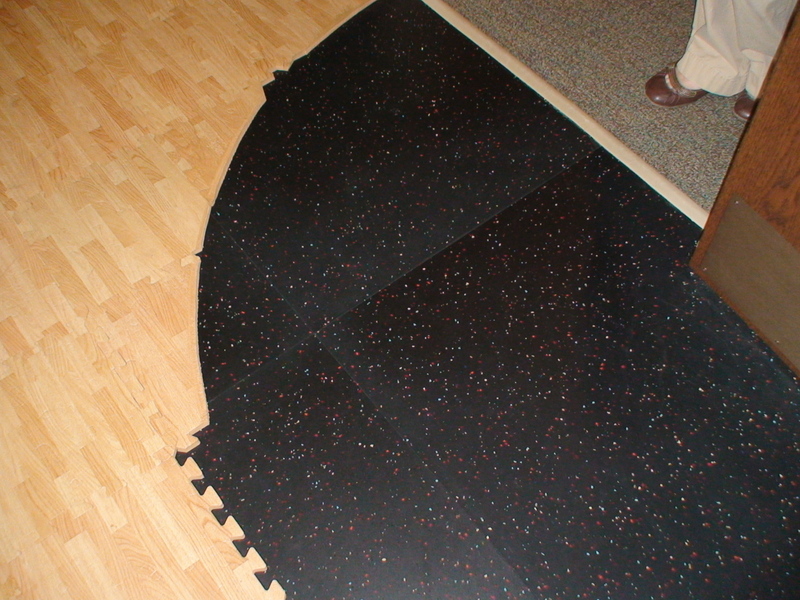 The black part of the floor is essentially a sub-flooring that might be used in a gym that is designed to absorb shock better than a concrete floor. (No I don’t know what company Stonebriar purchased this black flooring through, it was installed by the original builder. However you can Google “Shock Absorbing Floor System” and find a number of products and companies). Meaghan shared that while the black flooring provides a safer landing spot, it emits an unpleasant odor and is not particularly soft to the touch. To mask the smell and to provide a softer surface, Meaghan then found the wood-toned locking mats and just added them over the black flooring system. The puzzle mats are easily replaceable and don’t require a facilities manager or flooring company to actually cut and install replacement tiles (Meaghan just does it herself). What ideas do you have? Does your church have toys or an indoor play area that works well for children with special needs? We’d love to know what works inside your church. 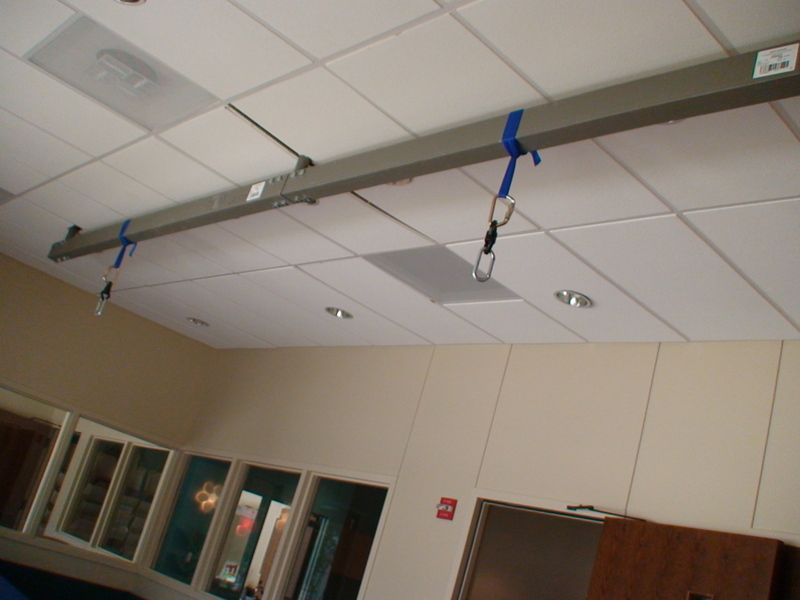 For more ideas on products for a special needs sensory room see the earlier blog post Products for the Special Needs Environment. Loving this series, Amy! What did she use for storing the ball up high? I can’t tell from the picture, but I would love to use that idea in our room for the couple of balls we will have in there. my son has a swing from southpawenterprises.com and he LOVES it. Love the sensory room. Brilliant. I’ve looked through all of your posts about your visit to Stonebriar Community Church’s Special Needs Ministry, and I’m just blown away. All of the features of their ministry are amazing—you can tell that they put a lot of thought into each and every nook, cranny, and tiny detail. Thank you so much for sharing! « Lifeway’s Kids Ministry Conference – Win a Free Pass!